Planning a Walkway or Park? Find a park or walkway nearby and plan your routes. Learn about our organization and get answers to frequently asked questions. Get updates and information about our various community-development projects. Make a donation, purchase a publication, or dedicate a plaque or bench. Looking to keep active during the winter? 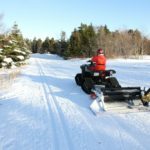 The CBS T'Railway is groomed for winter walking and snowshoeing and the Pippy Park trails are groomed for skiing and snowshoeing. Check our mapping for all winter trail routes. 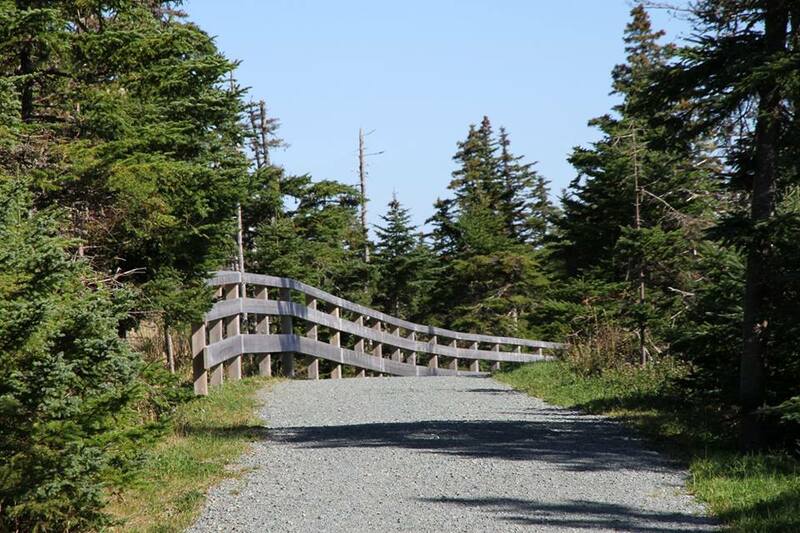 This trail is found in the sheltered valley of the Waterford River in Mount Pearl between Park Avenue and Topsail Road. 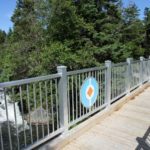 Explore the historic river which drains a 72 km2 area in Paradise, Mount Pearl, and St. John's. Four bridges allow views of the scenic cascades and rushing water. 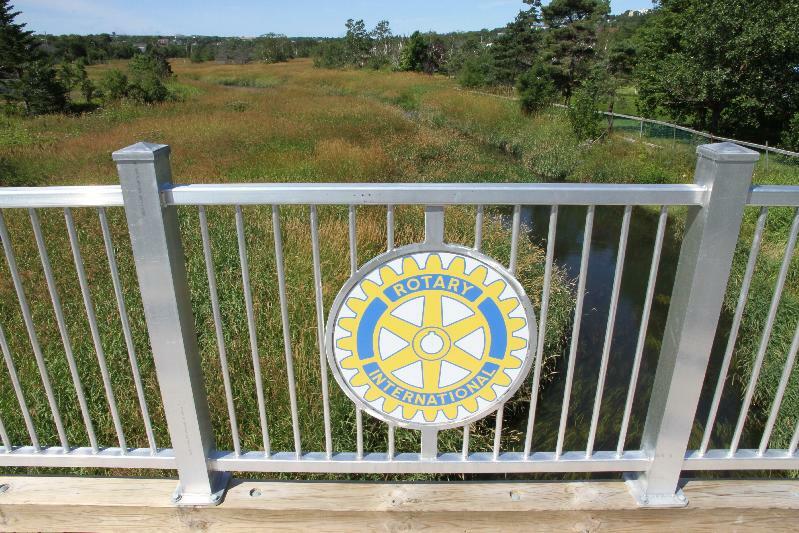 These trails were established by the Rotary Club to showcase the river and make it more accessible and enjoyable for residents. 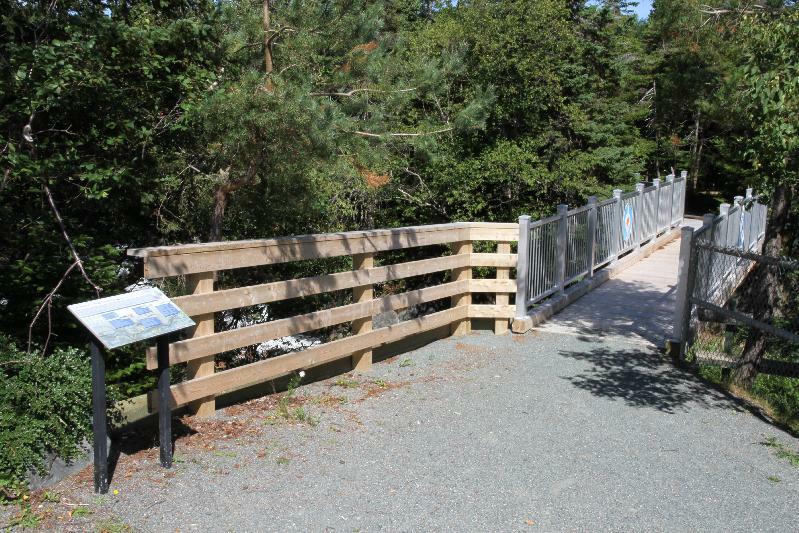 The Grand Concourse has been upgrading the approximately 1 km route and its bridges and boardwalks since 2016 on behalf of the City of Mount Pearl. There are several access points: behind Mary Queen of the World school, Forest Avenue, Clove Brae/Greenwood Crescent, and Park Avenue across from Avery Place. Be considerate of other users. Using a bell or saying "on the left" gives them a chance to react for a safe pass. Keep a reasonable pace. These are gentle routes meant for casual rides or active transportation. Need more exercise or an added challenge? 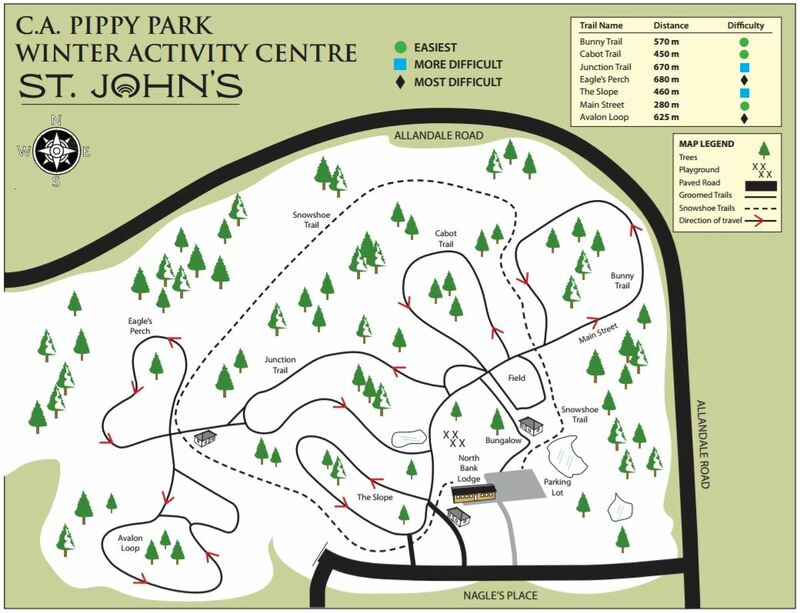 Check out bicyclenl.com or mountainbikestjohns.com for additional routes. Pay attention. Slow down in busy areas or where there are commonly slow-moving trail users. Watch the signage and obey the traffic laws. Many trails intersect with roads and some designations may change or connect with routes which do not have cycling designations. Be aware of other users. Occasionally glance forward and backwards and listen for other users or approaching cyclists. Allow space to pass. Walk on the right-hand side of the trail. If walking in a group, make a line when faster users approach. 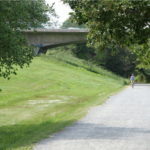 Consider the shared route as a roadway for bicycles and other trail users. Cyclists are often hyper-alert but inevitably will be moving faster than other users. If we can follow these tips and get along then we can seek further opportunities for trail development. We're happy to accommodate different types of users in our network planning and trail designs. We have been active in regional cycling plans and have added 14 kilometres of cycling-friendly routes so far through the Town of Conception Bay South since 2013. You can find our designated cycling routes at grandconcourse.ca/mapping. 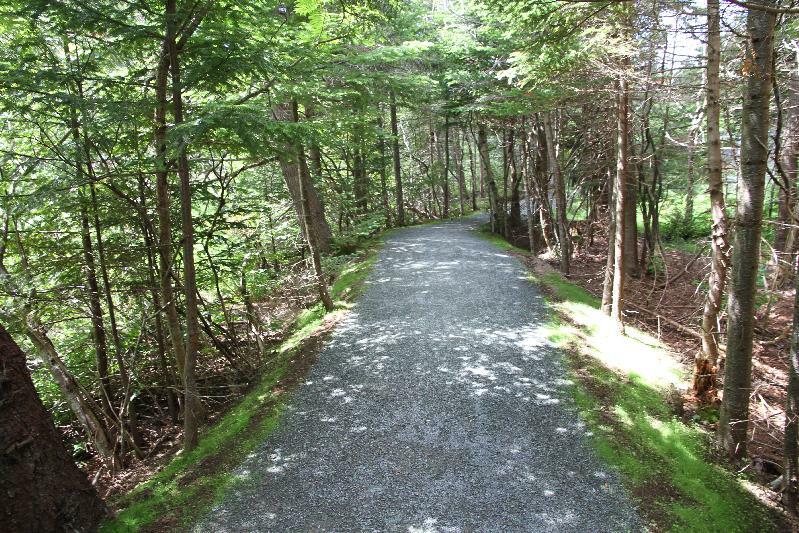 Follow the former railbed from the Railway Coastal Museum near St. John's Harbour. 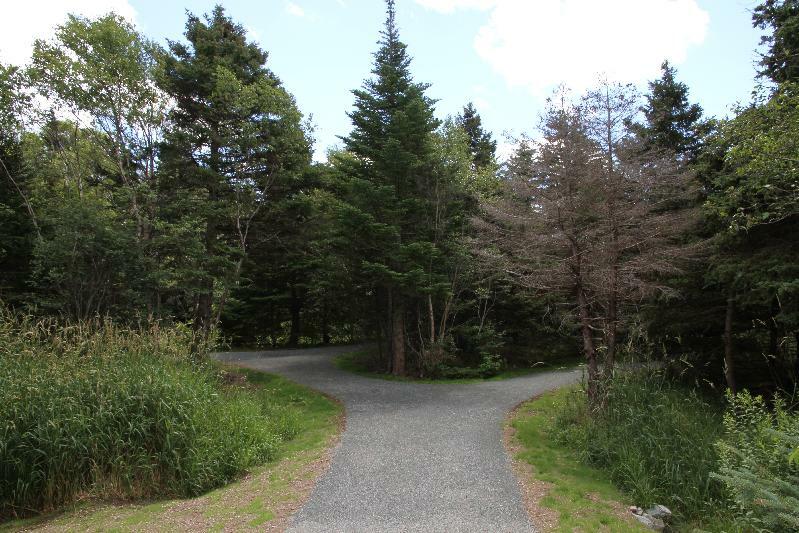 Continue through Bowring Park into the City of Mount Pearl. The railbed continues from Brookfield road behind farms and crossing Park Avenue in Mount Pearl. 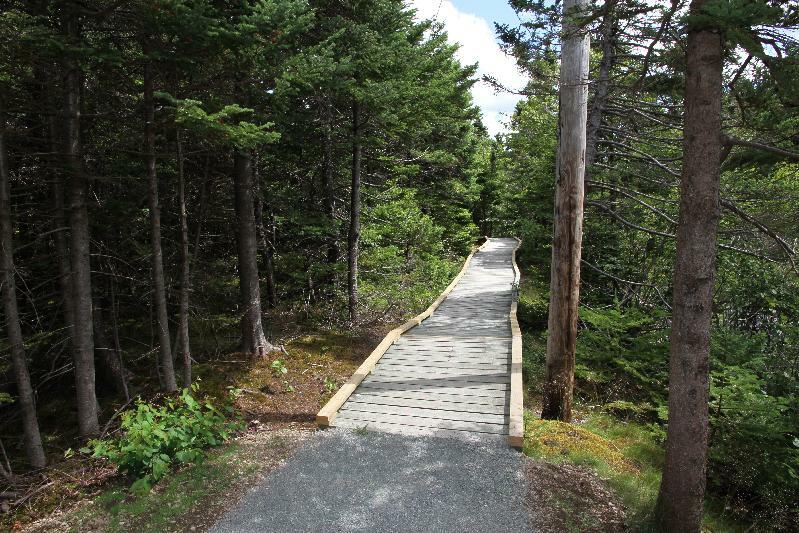 The route then travels alongside the upstream Waterford River to Power's Pond Park. The T'Railway continues through St. Anne Industrial Park along Topsail Road, passing Neville's Pond, Neil's Pond, and ending at Octagon Pond in the Town of Paradise. The CBS T'Railway route begins in Chamberlains at Spruce Hill Road and continues west, crossing Manuels River. The trail then passes centuries-old farms and diverts to the shoreline. It follows the rocky coast through tuckamore patches and pebble beaches as far as Lance Cove. 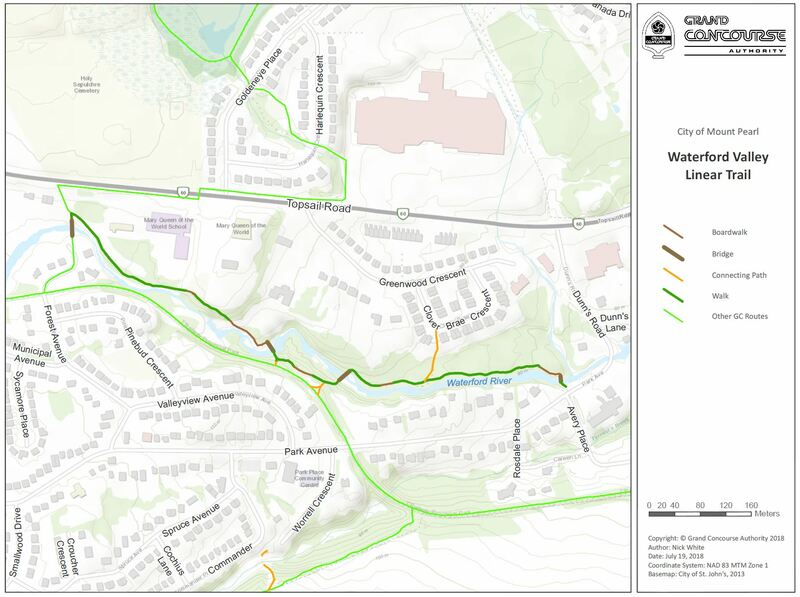 Another multi-use route starts at Penney Crescent (at Torbay Road) and continues west across wetlands, travelling upstream to Major's Path (at Portugal Cove Road). Travel northwest from Major's Path to Windsor Lake (a protected municipal water supply). This route passes residential neighbourhoods in Airport Heights and follows an old waterline known since 1812.